The APEC Economic Leaders’ Meeting in Yokohama City is coming in two months.APEC has attracted great attention in the world and approximately 8,000 people including leaders and ministers from each participating country and region will visit Yokohama. Since the opening of its port in 1859, as the gateway between Japan and the world, Yokohama has had a major impact on the modernization and globalization of Japan and supports the country’s growth and development today. 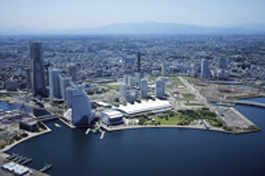 As a future growth strategy, Yokohama focuses efforts in the environmental field. Yokohama was selected as an“Environmental Model City” by the government in July 2008. Yokohama aims at reduction of greenhouse gases and large-scale introduction of renewable energy. In April, Yokohama was selected for the METI’s national project “Next-Generation Energy and Social Systems Demonstration Areas”, and with the other five companies including Nissan and Panasonic, Yokohama is promoting “Yokohama Smart City Project (YSCP)”, aiming to develop the Energy Management System (EMS) which optimizes energy demand and supply by leveraging IT. Yokohama City will introduce the environmental model city “YOKOHAMA” to the world by demonstrating by smart grid-related technologies, the Community Energy Management System (CEMS) and the Home Energy Management System (HEMS), at Minato Mirai 21 district during the APEC. In this tour, you will visit “PACIFICO Yokohama”, the international convention center which will be the venue of the APEC summit and ministerial meeting and cover Yokohama’s new environmental measures including YSCP. ※City of Yokohama, the host, and the Foreign Press Center, have co-organized this press tour. Born in 1946. She has served in a variety of key posts, including President of BMW Tokyo, Corp.; Chairperson and CEO, The Daiei, Inc.; President, Tokyo Nissan Auto Sales Co., Ltd. She was selected as one of Wall Street Journal’s “50 Women to Watch” in 2004, Forbes Magazine’s “The World’s 100 Most Powerful Women” in 2005, and Fortune Magazine’s “50 Most Powerful Women in Business: International” in 2008. She became mayor of the City of Yokohama in August 2009 (the city's first female mayor). She is working on the urgent issue of child-raising support and aims to enhance caring government services at the grassroots level. This project is to demonstrate the shape of new city management that will achieve a sustainable low-carbon city (smart city) by investing in cutting-edge technologies such as smart grid and electric vehicles (EV) to the overall social systems from the supply side to the demand side of energy. Its mission is to keep the existing city of 3.7 million citizens living comfortably and also develop a new social system that activates the regional economy, and in parallel, to export highly versatile Yokohama model solutions to foreign cities. First of all, YSCP starts from the Minato Mirai 21 district (MM21) as an area which presents demonstrations, taking the opportunity of the APEC, and it continuously develops with Kanazawa district’s Green Valley and Kohoku New Town. Yokohama will be the"Green Technology Showcase". Companies such as Accenture, Toshiba, Nissan, Panasonic and Meidensha are also participating in the project, which aims at 4,000 smart houses, 2,000 EV, and 1.6 million square-meter BEMS (Building Energy Management System). During the APEC, Yokohama City will introduce YSCP by demonstrating a smart house and an exhibition of electric vehicles at the Yokohama Home Collection (house exhibition space) in the Minato Mirai district. Located in the developed waterfront district Minato Mirai 21 in Yokohama, PACIFICO Yokohama is the largest international convention complex in Japan. Its exterior, designed to bring to mind ocean waves, wind and sunlight, has become the new landmark of the global megalopolis Yokohama. Since its inauguration in 1991, PACIFICO Yokohama has hosted numerous international conferences and events including the 4th Tokyo International Conference of African Development (TICAD IV) in 2008 and the grand ceremony of the 150th anniversary of the opening of the Port of Yokohama, which was attended by Their Majesties the Emperor and Empress, in 2009. 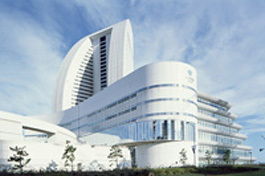 The Conference Center of PACIFICO Yokohama, the expected venue for both the 22nd APEC Ministerial Meeting and the 18th Economic Leaders’ Meeting in November, was renovated back in March and became more flexibly responsive to any requirement, as well as disabled- and environmentally-friendly. As many as 1,400 LED lights and human sensors were installed in the toilets, staircases and escalators. This will achieve an annual 137 ton-CO2 reduction. The Center will also strive to reduce usage of electricity, gas and water during the APEC. At the Clean Eco Center, they have reviewed and create a new framework of cleaning management in terms of environment, hospitality, safety and cleanliness and operate the whole process from cleaning to disposal of waste. Meanwhile, in collaboration with Yashiro Laboratory, Institute of Industrial Science, University of Tokyo, PACIFICO Yokohama formulated an “energy-saving action plan” in FY2009 and is currently promoting what it calls the “sustainable maintenance” of the facility; for instance, setting up visible measurements of electricity and other energy consumption as well as pushing through an energy-saving facility management. 3.Participants: Limited to the first 20 applicants for tour, on a first-come first-served basis.